RISE Program internships provide Agriculture students and alumni with the opportunity to work as part of a team of international volunteers providing soils and economic development training for the hundreds of remote island communities across the South Pacific. Working under the guidance of Sea Mercy’s RISE Program leadership, RISE interns will work with the remote island farmers through the training and implementation phases of the program, helping them return to the healthy, self-sustaining and thriving communities they once were. You will accomplish this through classroom teaching and field training about healthy crops and self-sustaining agricultural based income opportunities. Interns will travel by vessel and live with the targeted Fijian community during the 4-week program and work directly with the RISE Program leadership. Help change the world in the South Pacific one remote island community at a time! High-impact internships are available in a variety of fields for students serving on the remote islands of Fiji and across the South Pacific. Each remote island has unique challenges that must be addressed (irrigation, soil, income resources) requiring each RISE Program to be tailored to meet those challenges. This is a true ‘hands on’ internship and training opportunity that will allow students to experience the incredible beauty and culture of the South Pacific islands and people while working and learning alongside other like-minded agricultural students. Sea Mercy provides additional services for students, such as accommodation, arrival assistance, travel discounts, cultural training, transport to remote islands and social activities. If you are interested in becoming a RISE Intern Volunteer, use the below Volunteer button to start your incredible adventure today. RISE program Interns will not only participate in the RISE Program Soils Training Classes (the 4-day Introductory Soils Training Class, 4-day Advanced Soils Training Class and the 2-day Masters Soils Training Class), they will also act as RISE Instructor Assistants. This will include distribution and collection of training materials, classroom testing and grading, and logging data results. Students and Interns who pass the above classes will receive a Soils Training Certificate. 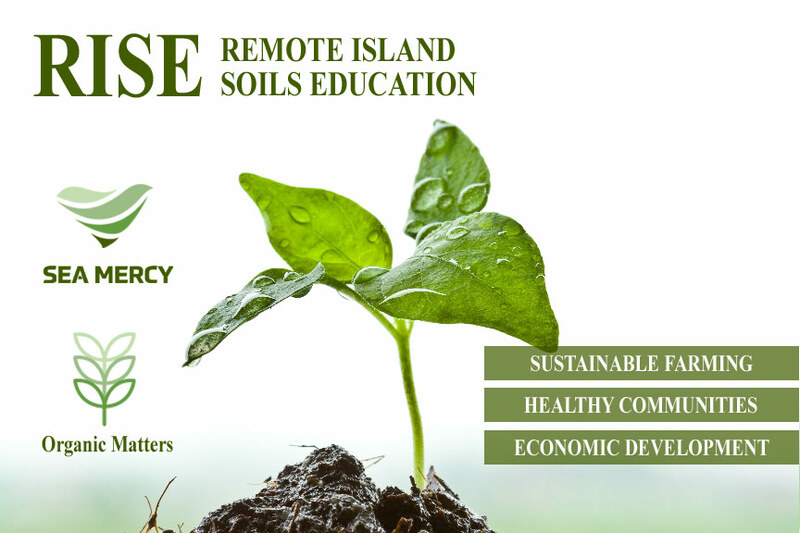 Taking what was taught in the Introductory, Advanced and Master Soils Training classes, Interns will work under the direction of the RISE leadership in assisting the remote island farmers to establish new vegetable gardens and improve existing gardens and farms across the remote island. Possible duties include the clearing of farm land, assisting in the training and installation of drip irrigation use/installation, developing sustainable use of bio-fertilizers, composting, effective cover crops, and balanced specific crop rotations for healthy nutrition. Interns will also perform island surveys to determine the potential of self-sustaining short, medium and long-term agricultural based economic opportunities on the island. This will include the potential for the current production of Virgin Coconut (VCO) and Dilo Oil production, Cas well as the potential for long-term production of Cocoa, Coffee, Vanilla, Sandalwood and Teak (to name a few). In addition, interns will participate in the building of Dilo Nut Dryers, training on VCO and Dilo Oil extraction equipment and storage, and future income crop planting areas. Interns will participate in the testing and evaluation of past RISE Programs to determine the effectiveness of the prior soils training education. Interns will also participate in the evaluation and testing of future RISE Program remote islands and discussions with remote island leadership. Both will require the interns to travel with the Sea Mercy leadership to other remote islands via motor or sailing vessels and collect and document the evaluation data. Some remote islands have a sizable number of livestock (chickens, goats, sheep, and cattle) that if trained and used effectively, could help further develop healthier diets and assist in the reclaiming of lost agricultural land and soil replenishment through proper grazing and fertilization techniques. Based on past data collected, AH Interns will work and travel with RISE Program leadership and help develop and implement effective programs. Candidates are encouraged to apply from a variety of academic backgrounds. Students should have an interest in non-profit program management, community-based agricultural development, animal husbandry and working in rural communities. Ideal candidates will be working towards or have a degree in either agriculture, indicating: a familiarity with methods for successfully growing most crops sustainable scale, and/or animal husbandry and their effective use in small farm environments. Interns should be familiar with various organic fertilizers and irrigation methods, with the initiative to teach them to others. Knowledge of statistical analysis and data collection is preferred to help develop a formal monitoring report. Interns must be flexible, patient, motivated, self-directed, and culturally sensitive. Interns should become familiar with remote island communities, and must be capable of overcoming setbacks and frustrations that are often typical when working in a developing country. Interns must also be able to work well in both field and office environments. Both undergraduate and graduate candidates are encouraged to apply. Fluency in English and the willingness to work with local Fijian staff, students and liaison team members. Interns should keep in mind that they are there to assist Sea Mercy in its mission to develop healthy, self-sustaining and thriving remote island communities. Interns must be prepared to prioritize Sea Mercy’s and remote island needs and culture over personal interests. Interns should be knowledgeable about practical agricultural matters and be able to offer helpful ideas and suggestions to RISE Program staff. Interns should be familiar with tropical remote island climates and be able to help manipulate conditions to the advantage of the soil project. Below are the estimated costs for the 4+ week RISE Program Internship. Sea Mercy will be responsible for arranging and covering the costs of all land and sea based housing arrangements during the Internship program dates. Accommodations will range from hotels to tents during your internship time. Food can range from group meals to lunch boxes, freshly caught seafood to home cooked rice and bread provided by the local islanders. Please note, expenses incurred for arriving early or staying beyond RISE programs dates for personal recreation or vacation, will be at the intern’s expense.